hmv Vinyl Week 2018: second batch of exclusive titles revealed! hmv Vinyl Week is approaching fast and there are just a couple of weeks left to go until our vinyl racks are laden with loads of discounted wax and some very special exclusive titles available only in hmv stores. The eighth studio album from Marc Bolan & co. (and their fourth under the abbreviated name T-Rex), Tanx arrived in 1973 and took the band in a slightly different direction, embracing the sounds of soul & funk and moving away from the pure, unadulterated glam of their earlier records. Our exclusive version coming to stores on June 16th is a beautiful limited edition pressed onto etched pink vinyl. Up until now, the only time that the soundtrack for the hit musical based on the songs of ABBA has been released on vinyl was an extremely limited run in the U.S. in 2017, but this year we've gone one better with this exclusive picture disc, limited to 1000 copies and available only at hmv stores. Synth-pop outfit Orchestral Manoeuvres in the Dark made a comeback in 2010 after an absence of nearly a decade-and-a-half with their 11th studio album History of Modern, and on June 16th you'll be able to get your hands on this exclusive limited edition pressed onto colourful orange vinyl. A decade on from the release of this greatest hits compilation from Welsh rockers Stereophonics, a brand new limited edition version of Decade in the Sun pressed onto stunning gold vinyl will be landing on the shelves in hmv stores. Sheffield heavy metal legends Def Leppard have handed us an exclusive limited run of their greatest hits compilation charting their first 15 years of hits. Pressed onto clear vinyl, Vault is set to arrive stores along with the other exclusive titles on June 16th. 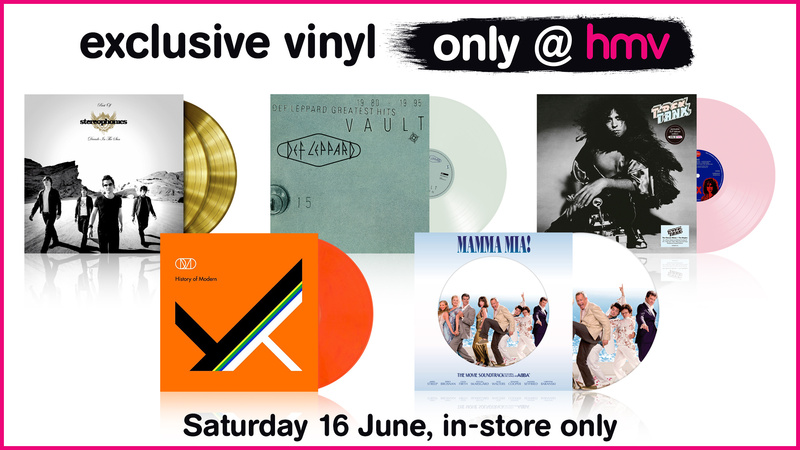 All the exclusive titles are available in-store only and are available on a first-come, first-served basis, so be sure to get down to your local hmv nice and early! Want to first to hear about the exclusive vinyl announcements? Sign-up here and you'll be the first to know! hmv Vinyl Week 2018: first exclusive titles revealed!